A film capable of tying political and economic freedom together in one story is rare, but the British film A United Kingdom makes a valiant effort. The story hinges on the culturally and politically taboo romance and marriage between the heir to the throne of Bechuanaland (modern-day Botswana), and his white, working-class English wife in 1948. 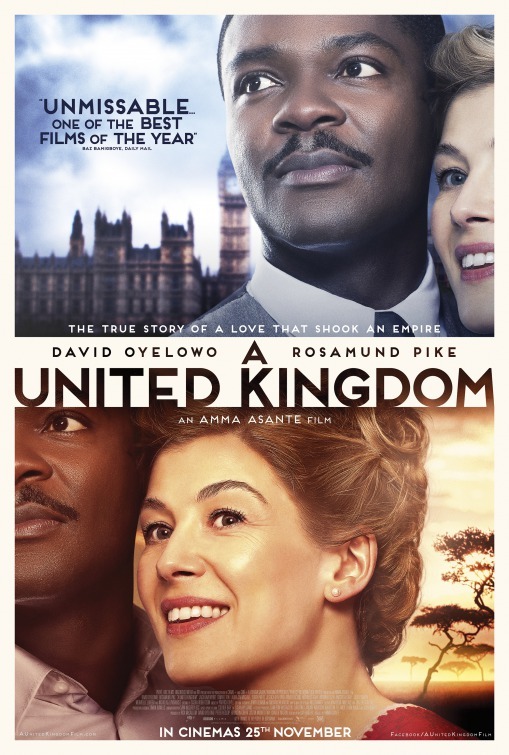 While the film focuses primarily on the political implications and intrigue triggered by their marriage, the story is perhaps more important because it also exposes the intellectual foundations for what would become Africa’s most important and sustained economic success story (which I discuss further here). Sir Seretze Kama III (David Oyelowo, Selma, The Butler) was studying law in London when he met Ruth Williams (Rosamund Pike, Die Another Day, Gone Girl, Pride & Prejudice ), a clerk. Kama became the designated heir to the throne of Bechuanaland as an infant after his father passed. He was groomed for his future role under the guardianship of his uncle, Tshekedi Khama (Vusi Kunene, Cry the Beloved Country), and was educated in South Africa and England. The mixed marriage was opposed by both the English authorities and Tshekedi, who served as regent of Bechuanaland under British colonial rule. One of the more refreshing elements of the film is its nuanced approach to racism. British racism is shown through two prisms. The first is through the rote prejudice familiar to most western audiences, in which Africans are treated as an inferior, substandard race. This is shown dramatically when Ruth is disowned by her father after she announces her marriage to Seretse Kama. The second lens is through the more subtle but equally revolting colonial paternalism that viewed other cultures as backward and less sophisticated to justify subservience to the heavy hand of the state. The first form of racism drives much of the plot underlying Seretse and Ruth’s romance, while the latter form drives much of the plot in the second half of the film center on international intrigue. On the African side, tribal elders, particularly Tshekedi, were angry at Seretse’s breach of tribal custom and his willingness to embrace someone that symbolized colonial exploitation. The film explicitly ties racial prejudice into tribal and familial resistance to Ruth Williams, prompting a dramatic scene where Seretse pleads with members of his tribe to accept his love for his people and his love for his white wife. Seretse’s public meetings (which occurred in reality) convince the elders that he is still deserving of the throne, despite his transgression of tradition and custom. This social liberalism is a defining element of the film. Kama’s social liberalism, however, complements a theme of economic liberalism and independence that is also more layered than most anti-colonialism films. During his active tenure as chief, Kama begins to understand the economic potential of Bechuanaland and its people, and how its subservient role as a protectorate hinders its ability to create wealth and grow. Britain’s colonial rule, as would be expected, is the foil for this argument, but Kama makes his case by repurposing a quote from the Greek philosopher Epictetus: “No man can be free who is not master of himself.” Kama, in the film or in real life, does not call for citizens to come together as one for a united purpose, but for each person to have the freedom to craft their own political and economic destiny. A free Bechuanaland, however, does not fit the political interests of Britain. The Cold War and the drive to maintain relations with the Republic of South Africa, which is implementing strict racial segregation through Apartheid, lead Britain to refuse Seretse Kama as the legitimate king. The British government exiles him from the kingdom throughout the early 1950s. Authorities repress an internal government report (also true) that validates Seretse’s rightful claim to leading Bechuanaland. Fans of Winston Churchill will be chagrined to learn that he reneged on a campaign promise to reinstate Seretse, a promise the film suggests was important to the Conservative Party’s re-election in 1951, by converting his five-year exile into a permanent one after the election. Eventually he agrees to relinquish his claim to the throne in 1956 and returns to Bechuanaland as a private citizen. This is where the story in the film ends, but really it serves as a prelude to the second half of Seretse’s political career. Under Seretse’s non-tribal political leadership, Bechuanaland gains its independence as Botswana in 1966. Botswana was transformed from one the poorest regions in the world in the 1950s to one of the richest in Africa in 2015. It achieved this growth through market-oriented policies that supported export-led growth in cattle and minerals (copper and diamonds at first and later nickel and coal), an open economy with a business-friendly climate, and stable political democracy. Low and stable taxes for mining companies, low marginal income tax rates to avoid tax evasion, institute strong anti-corruption policies. Government employees were hired based on merit. Kama also encouraged the use of expatriates and foreign consultants as the economy ramped up. A useful summary of the effects of these policies can be found in a 2016 article in Reason magazine (see also here). As a film, A United Kingdom has earned favorable reviews from critics. Oyelowo provides a compelling portrayal of Seretse Kama as a multifaceted and sophisticated, if somewhat naive, character who understands the cultural challenges his wife will face in Botswana, but who underestimates the degree of resistance to his marriage. Pike turns in a strong performance as Ruth Williams Kama grasping at a culture about which she knows little but is willing to learn and embrace. Unfortunately, the film tries to do too much, never quite deciding whether the story should focus on the romance, political intrigue, or the powerful figures and forces that turned a subsistence agricultural economy into a politically stable, independent, market-oriented economic juggernaut. The sensitivity and nuanced approach to race and politics may well be attributed to up and coming British director Amma Asante (Belle, A Way of Life), herself the daughter of English and Ghanian Parents. But the true magnitude of the challenges facing Ruth Williams are never fully explored outside her attempts to gain acceptance among the tribe and Seretse’s family. She wins them over in the film, as she did in real life, but the enormity of the challenges Williams faced moving from a comfortable working class London lifestyle to the destitute, subsistence economic conditions of Bechuanaland are never adequately examined. In part this may be because Ruth Williams Kama was a larger than life person in her own right and her story deserves its own movie. The Kama’s story could easily fill a third movie that focused on Botswana’s unlikely success while surrounded by leftist African revolutionaries and South African Apartheid. Even with these weaknesses, A United Kingdom is a much better movie than its paltry box office revenues of just $10 million suggest. Its freedom-based themes are well worth the time spent in the theater. A United Kingdom is an excellent film for anyone interested in learning about an alternative path to economic success on a continent that is known more for its hostility to personal and economic freedoms than its support for them.